Every financial institution has the same general strategy: make sales, increase membership, and cut costs while delivering better service. But too few FIs have a comprehensive digital strategy and that means they are leaving money on the table. Banking technology is developing so rapidly that even small FIs can afford it. What they can’t afford to do is to fail to employ mechanisms that simplify their processes, increase their transaction speeds, and give them the credibility of a 21st Century business. Henk Broeders and Somesh Khanna of Global consulting firm McKinsey and Company said banks that fail to digitize have 5 years max left to live in their article titled, “Strategic Choices for Banks in the Digital Age.”Additionally, Broeders and Khanna outlined the 4 absolute necessities that banks must achieve through digital means in order to stay viable. one that seizes on opportunities for digital sales. “Digital sales have the potential to account for 40 percent or more of new inflow revenue in the most progressive geographies and customer segments,” according to Broeders and Khanna. 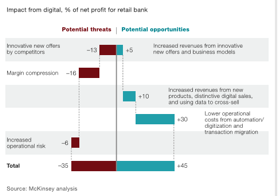 This is why you need to refocus your entire banking strategy into a digitally centered business model. It means going further to ensure your customer-facing channels are user-focused, that you can leverage your data to make transactions that have a personalized touch, and that you implement a design that’s agile enough to accommodate the latest banking craze. Sure these measures may require dramatic changes, but if you don’t take advantage of these opportunities your competitors will be happy to do it for you.